The movie itself is a fairly pedestrian yarn about horses—lots of horses. Carol Clayton (Jean Harlow) is engaged to marry Hartley Madison (Walter Pidgeon), a big-time gambler. Duke Bradley (Clark Gable) is a bookmaker who wants to win a large sum of money from Madison, eventually deciding that he will use the money to marry Carol and bring security to the Clayton family’s faltering horse-breeding estate in Saratoga, which is currently being minded by Grandpa Clayton (Lionel Barrymore). All of the characters take the train up and down the coast to attend races and horse auctions, and there are some hijinks as Carol and Bradley spar and fall in love, but eventually Bradley wins a large sum of money off of Madison and happily runs off with Carol. I hate to admit this about myself—well, almost hate to admit it—but the reason I watched this movie was because I knew that it was Harlow’s last film, and I also knew some of the details of its completion. Following Harlow’s death, MGM wanted to reshoot the film from start to finish with Jean Arthur or Virginia Bruce, but the public was hostile to this idea. So the studio instead chose simply to preserve what had already been shot and to reconfigure the remaining scenes so that they could be filmed using a Harlow body double (Mary Dees)—who either has her back to the camera, is holding up binoculars to conceal her face, is wearing an obscuring hat, or is shot from far away—and a voice double (Paula Winslowe). Dees first appears in the Churchill Downs sequence about two-thirds of the way into the movie. From then on, Harlow’s actual appearance in the film is spotty; this includes even the picture’s climax. It is clear that the scenes in which her double appears have been trimmed and rearranged considerably to make them work, and the movie pulls off this odd feat with some success. Still, even with Paula Winslowe’s off-camera vocalizations, the Harlow character does not say much in these scenes; I think the filmmakers did not want to press their luck. As a result, the last part of the movie is devoid both of Harlow’s personality and the dynamic between her and Clark Gable, and it feels somewhat ghostly and unreal. Nevertheless, the completed film was enormously popular, so from a financial perspective, at least, using the stand-in and voice double was wise: Saratoga was MGM’s highest-grossing film of 1937. It may be hard to imagine a modern Hollywood project completing filming in this way and having such success. One is tempted to think of Ed Wood’s dreadful Plan 9 from Outer Space (1959): its star Bela Lugosi also passed away during filming, but unlike Harlow, he shot only a tiny portion of the movie before his death. Wood chose to film the rest of the movie with a stand in rather than reshoot, and the results are famously laughable (the stand in for Lugosi repeatedly holds a cape up to his eyes to cover his face). Unlike Plan 9 from Outer Space, Saratoga uses its star’s doubles wisely and professionally. Besides, if we think Saratoga’s producers made an odd choice to continue without Harlow, we should consider how alien other aspects of this film are. For example, as the character Grandpa Clayton (Lionel Barrymore) shows a horse graveyard to bookmaker Duke Bradley (Clark Gable), it is clear that they are on a large Hollywood set that has been planted with real turf, plants, and trees and on which a horse is walking around, nibbling at grass. What filmmaker would bother to do such a thing today? And yet recreating reality on a sound stage was what old Hollywood was all about. The studios would go to tremendous lengths to shoot in Hollywood and indoors, believing that it both was more economical to do so and that it afforded more control to filmmakers. It is not really so surprising, then, that in an era where everything else was recreated, a star like Harlow could be impersonated in her own movie as well. Watching this movie can turn into a slightly macabre activity. 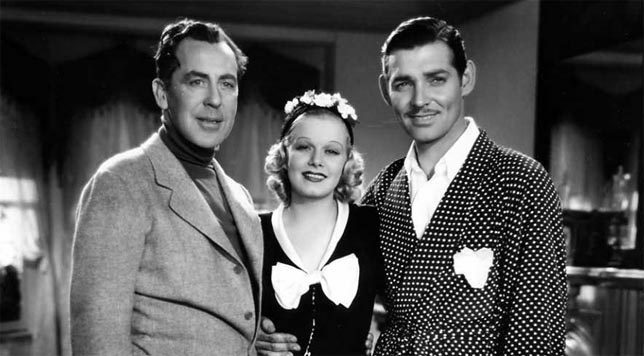 Harlow collapsed on the set moments after filming the scene where she accosts Gable at breakfast; Gable is wearing a silk robe with a pocket square and Harlow is wearing a black dress with a white bow on the chest. It is very strange to watch this scene and realize that it features one of Hollywood’s most prominent stars just moments away from the full physical manifestation of the illness that would kill her. She could not have been feeling well; indeed, she looks slightly puffy throughout the film. Yet I think that realizing that this scene is Harlow’s last filmed performance actually serves to make her very human. She was one of the great blonde Hollywood bombshells, a seemingly untouchable superstar. As a stunt, the studio at one point had encouraged women and their hairdressers around the country to participate in a contest to see who could recreate Harlow’s precise shade of blonde: clearly she was marketed as a screen idol whom American women were supposed to envy and emulate. To think that this movie captures something of her real-life vulnerability, rather than her larger-than-life reputation—even though the capturing of that vulnerability is incidental and accidental—is potentially moving. I must confess that I am not the biggest fan of Harlow’s signature look or her acting. The plucked and thinly penciled-in eyebrow lines, very dark and severe in comparison to her fluffy platinum hair, just do not appeal to me. I also have a hard time understanding a lot of what she says. Presumably this has to do in part with the fact that her character is feigning an English accent at the beginning of the film, having just returned from a trip abroad. But even after her character drops the accent, Harlow still sounds mealy-mouthed to me. I also noticed that, for the most part, when she has dialogue with another character, she tends to stare straight at her interlocutor when it is that person’s turn to speak. There is almost never a time when she focuses on something else in the room or turns her gaze inwards, and as a result her performance does not feel very natural. I am tempted to chalk these opinions about her acting up to the fact that she was very ill when filming began, and so she may not have performed with her more habitual skill. On a final note, Saratoga also brings together actors who would go on to star in two of the best-known movies of the 1930s. The first of these pairs is Clark Gable and Hattie McDaniel, who would just a few years later appear in Gone with the Wind (1939). In Saratoga, as in that movie, they have nice chemistry together as the clever suitor and the lady’s maid. The second pair of actors consists of Frank Morgan and Margaret Hamilton, who appear seated together in a dining car during one of the train scenes. If those actors’ names do not immediately ring a bell, I am talking about the man who played the Wizard of Oz and the woman who played the Wicked Witch of the West in the 1939 adaptation of L. Frank Baum’s novel. It is a strange thing indeed to hear them exchange dialogue about how to correctly apply cold cream. I am sure I am not the only one who feels chills run up her spine whenever she hears Margaret Hamilton’s voice.